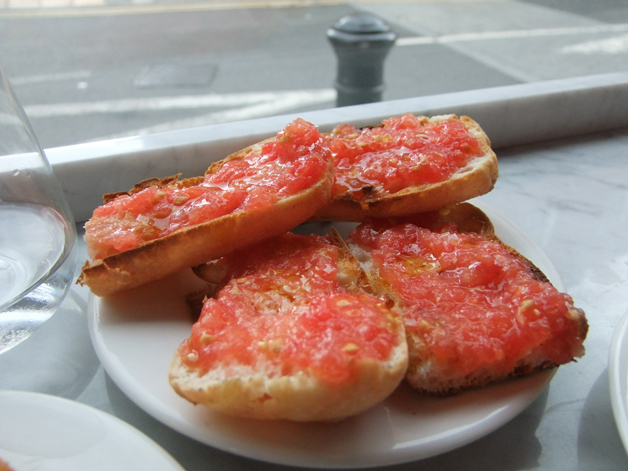 Jose review – best budget Tapas in London? I seem to be eating at lot of tapas restaurants recently which hasn’t been the result of some grand plan, but probably an unconscious result of my complete failure to have any tapas at all during my recent trip to Madrid. My latest jaunt was south of the river at Jose, a small bar with around a dozen or so stools. It’s just 10 minutes walk from London Bridge. Unlike all the other tapas eatieries in London I’ve been to, Jose is really more a bar that also serves good food rather than a full-blown restaurant. Service was still friendly, informative and efficient though. Unfortunately I can’t tell you much about the extensive wine list – I’m not a drinker and the Euro Hedgie was still nursing a hangover so he was off the booze. Named after chef-proprietor Jose Pizarro, who formerly worked at Brindisia, Jose was fairly quiet on the Sunday lunchtime of our visit, but that did make it a bit easier to appreciate the décor which just manages to avoid being clichéd. The exposed brick walls as well as the timber floor and ceiling won’t win any awards for originality, but the decorative Iberian tiles are a nice touch. I could’ve done without the easy listening soundtrack though. 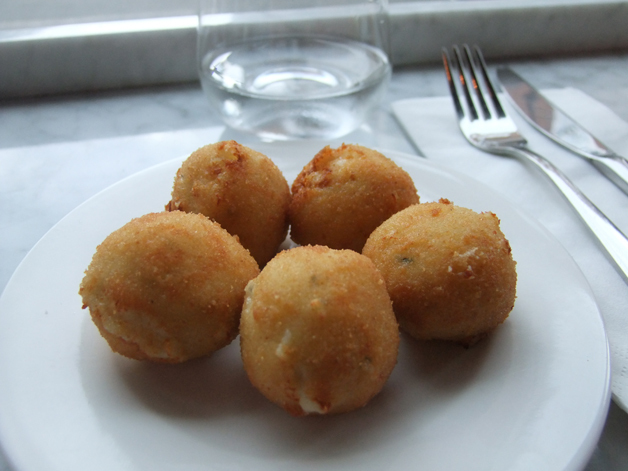 I usually avoid croquettes at tapas eateries since I find them to be stodgy, bland and oily. The Euro Hedgie nevertheless convinced me to try the croquettes at Jose and I was glad I did. They were very fluffy and light with a distinctive, but not overpowering, taste of blue cheese. All without a hint of oil too. Jose has restored my faith in croquettes. The best croquettes I’ve had in a long, long time. Some of the more interesting sounding items on the menu, such as the mackerel escabeche or hake in aioli, were sadly unavailable – no doubt Jose was awaiting its next delivery of fresh fish from Billingsgate. If the quality of the simpler dishes is any indication though, they should be corkers. The simple dish of tomatoes on bread was surprisingly tasty with a light, gently sweet puréed tomatoes resting on fluffy chunks of bread with crisp crusts. Don’t underestimate the tomatoes on bread. The almost-as-simple Patatas Bravas was a success too. The light and fluffy potato chunks were perfect carriers for the fruity, gently sweet tomato paste that was as far removed from the thick, saccharin taste of ketchup as you could imagine. The creamy aioli wasn’t too overpowering in its garlic-iness which I appreciated, although garlic fiend LeChuck probably wouldn’t. Those are complimentary nut sacks snacks in the background in case you were wondering. The one fish dish we did have was the grilled sea bass. 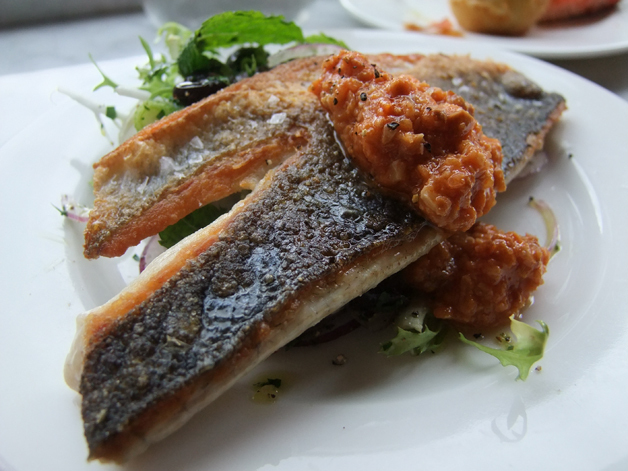 The flavour of the fish was a little muted, but the crisp skin was perfect when topped with the lightly spiced sauce. The accompanying salad wasn’t an afterthought with its refreshing combination of olives, red onions and spring onions. Not bad, not bad at all. 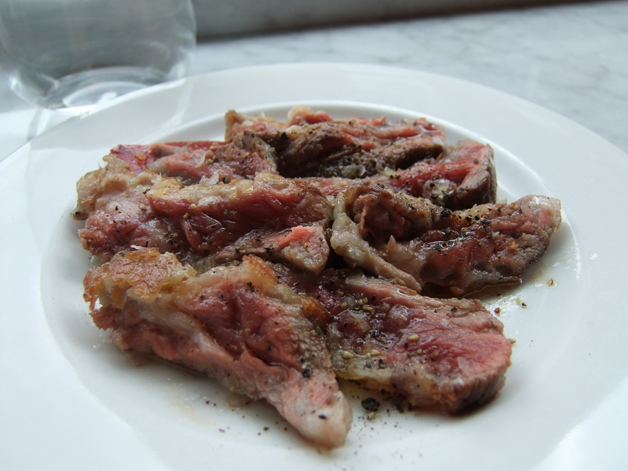 We ended our meal with one of the blackboard specials – pluma iberica. These deceptively simple slices of pork, oddly cooked rare, pack a lot of flavour into such compact slivers of flesh – a lip smacking mix of fatty, salty and peppery hits in meat that almost’s like beef in its marbled texture. Simple and gorgeous. Pork cooked rare. Don’t be afraid. Don’t be fooled by the seemingly small selection of dishes the Euro Hedgie and I shared – not only was our flavoursome meal almost consistently well-executed, it was also filling without being too heavy. It’s also a bargain at just £27 for the two of us, or just £14 each, which is superb value for such a high standard of cooking. Jose could do with a stand-out, signature dish but even without one I’ll be heading back frequently. Opening Hours: Monday-Saturday noon-22:30; Sunday noon-17:30. 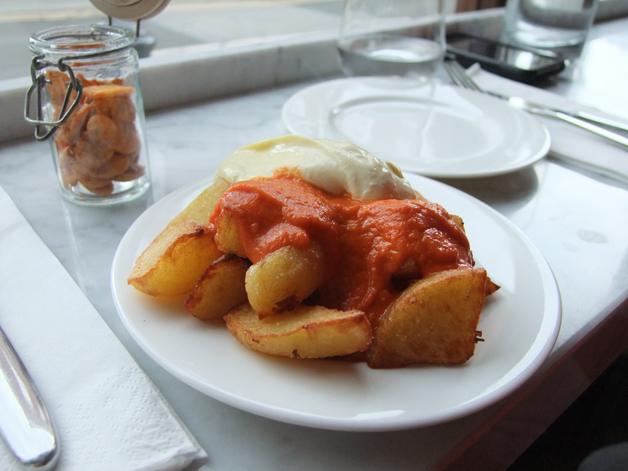 Tags: bermondsey street, blue cheese, bread, croquettes, josé pizarro, jose, london, patatas bravas, pluma iberica, restaurant review, sea bass, tomatoes. Bookmark the permalink. Previous post ← Busaba Eathai review – have standards slipped? I’d give it a 4.5 or just a 5. I can’t think a place where pork has been so yum.